Real-time Results at Eddy Covariance Systems. Contact us at envsupport@licor.com if you are unable to complete your request. Whether you need a basic eddy covariance system for evapotranspiration and carbon dioxide flux measurements, or an advanced system that includes methane, biological, and meteorological measurements, LI-COR solutions give the results you need. Each system computes results in real time with EddyPro® Software, the industry-leading eddy covariance computation software, which runs on the SmartFlux System just as it does on your desktop computer. Optional FluxSuite Software puts your flux system online so you can monitor station status and results from your office, home, or on the go. EddyPro® Software is a powerful application for processing eddy covariance data. It computes fluxes of water vapor (evapotranspiration), carbon dioxide, methane, other trace gases, and energy with the eddy covariance method. EddyPro has been widely adopted by researchers and networks around the world, including the Integrated Carbon Observatory System (ICOS), the Chinese Ecosystem Research Network (CERN), AmeriFlux, and many others. EddyPro is an open source software application developed, maintained and supported by LI-COR Biosciences. It originates from ECO2S, the Eddy Covariance Community Software project, which was developed as part of the Infrastructure for Measurement of the European Carbon Cycle (IMECC-EU) research project. We gratefully acknowledge the IMECC consortium, the ECO2S development team, the University of Tuscia (Italy) and scientists around the world who assisted with development and testing of the original version of this software. Click here for more information about the ECO2S project. Need to cite EddyPro in a publication? Fratini, G. and Mauder, M. (2014). Towards a consistent eddy-covariance processing: an intercomparison of EddyPro and TK3, Atmos. Meas. Tech., 7, 2273-2281, https://doi.org/10.5194/amt-7-2273-2014. 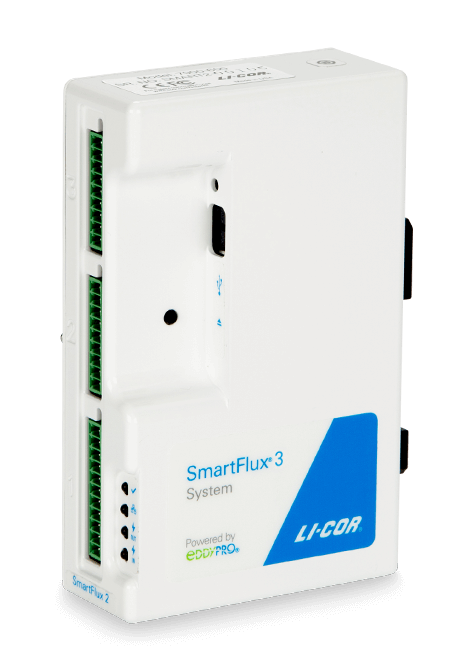 SmartFlux is the on-site processing and GPS synchronization component of LI-COR eddy covariance systems. At the heart of SmartFlux is EddyPro Software. Running on a microcomputer inside the SmartFlux module, EddyPro provides fully processed flux results in real time using raw data from a LI-COR gas analyzer and a sonic anemometer. It incorporates data collected on a variety of data loggers, including the LI-COR Biomet System or the Campbell® Scientific, Inc. CR3000, CR1000, and CR6 data loggers, giving you the flexibility to build the eddy covariance system that meets your needs. The SmartFlux System is included with the purchase of an LI-7500DS or LI-7200RS gas analyzer. It also is available as an upgrade for existing eddy covariance flux systems. Fully processed eddy covariance fluxes—sensible heat, latent heat, evapotranspiration, CO2, H2O, and CH4—along with raw data, biomet data, metadata, and diagnostics. Advanced site-specific raw data processing, including in situ spectral corrections, customizable planar fit approaches, footprint calculations, and more. Precision clock synchronization within sites and across sites using GPS/PTP time alignment of high-speed data, including the sonic anemometer and gas analyzer measurements, and low-speed data, such as biomet data. SmartFlux mounts at the base of the eddy covariance station, making it easy to access logged data and flux results from the removable USB drive. Automatic transfer of raw and processed data files to a network server or a private repository, such as Dropbox. Georeferenced measurements and flux footprint make results easy to use in geographical applications, such as remote sensing and modeling. Get online results, status information, and email alerts from your eddy covariance sites—whether you have one station or many stations. 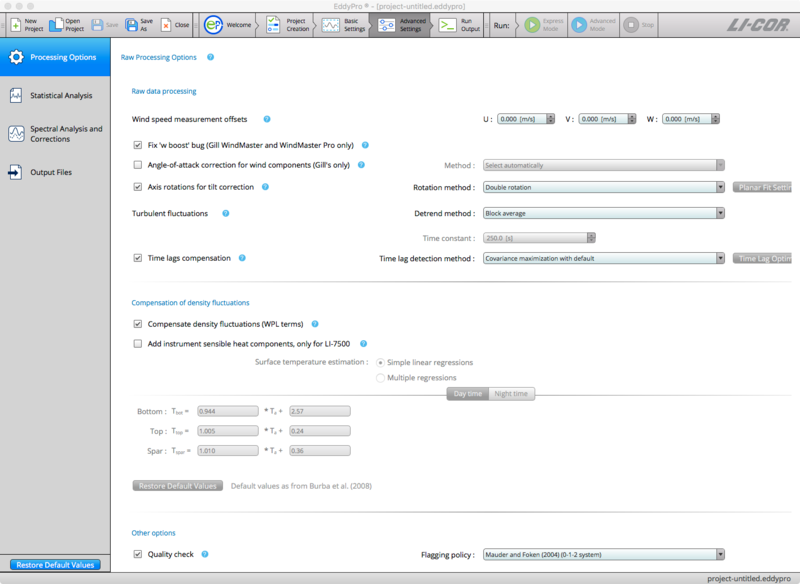 With FluxSuite Software, you can view real-time final fluxes—processed by EddyPro Software on the SmartFlux System—on your smartphone, tablet, or computer. FluxSuite is a secure web service that shows fluxes, biomet data, and status information from your site. It provides e-mail alerts if there are issues at your station, which allows you to quickly recognize and address any problems. 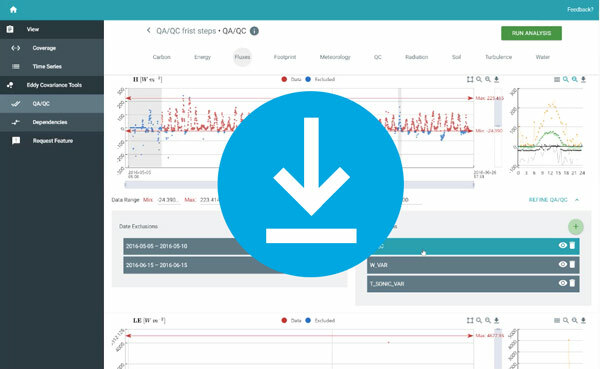 Get to scientific discovery much, much faster, with this powerful new data analysis software package.